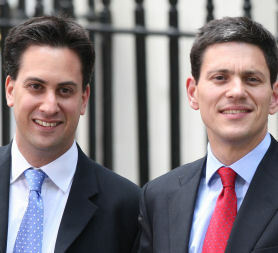 As two major unions, Unite and Unison prepare to announce this week which candidate they will support in the Labour leadership contest, political editor Gary Gibbon analyses how the battle is testing the brotherly bond between David and Ed Miliband. Tony Benn says that Ralph Miliband, father of the Miliband boys, once said to him that when they were young one of them said, after a long chat about socialism: "but will it work?" When I told David Miliband the anecdote he said: "I hope it was me." Tony Benn also tells us that he thinks his old friend Marion Kozak, the boys' mother, "must be feeling the strain" watching her sons compete. No question which one Tony Benn would like to see seize the prize in September - "Edward," as he knew him, worked for him as a teenager and was "very sweet" he says. In the last few days I've followed the brothers to a Unison hustings in Leeds where Ed told the audience: "As your leader I will never leave this party behind." Not the leadership style brother David aspires to. He also speaks of loving the party but he feels he's telling them a few more home truths and it's probably not worth winning the leadership if you don't. At Unison, I found lots of Labour activists who would back Ed, some converted by the experience of listening to him (only one who kept getting the two confused). Another leadership contender Diane Abbot Channel 4 News: "Ed Miliband is wonderful but he's a touch presidential. His brother is wonderful too, but many things he's saying now, he wasn't saying six months ago." In Newport, at a Labour activists meeting addressed by David Miliband I found a party member who felt brother David was telling her she couldn't have lots of pet policies she might like and rather respected that. Friends say that the private, lengthy chats between the brothers that have been a huge part of their lives have dried up since brother Ed's declaration. Both brothers will hope that things return to normal when they have put this contest behind them ... but it's hard to imagine how they will ever be quite the same again. Brother David says he would serve under his younger brother if he was elected, but you wonder. He told me "I think that I am the best person to lead the Labour party not just in opposition but in government. If I thought he (Ed) would be a better leader of the opposition and a better Prime Minister, I'd be running his campaign." There were a few dog-whistle moments in the hustings - odd barbed asides which probably serve no purpose other than to niggle the opponent. David Miliband made pointed criticism of the 2010 manifesto, in full knowledge that his brother was responsible for writing it... something that was almost certainly lost on everyone else in the room. Why? Andy Burnham seemed to be getting feisty with the dog-whistle stuff too. He attacked candidates who were "parachuted" into parliamentary seats, meaning none other than the Miliband brothers themselves, parachuted by their respective patrons, T. Blair and G. Brown. Gordon Brown is said to have told close aides some time ago that he thought only Ed Miliband would be able to stop the David bandwagon. Some of David's most senior supporters agree with that. Tony Blair is quietly hoping David Miliband wins the crown.